Adele Nominated for an Academy Award; Will She Win the Oscar? 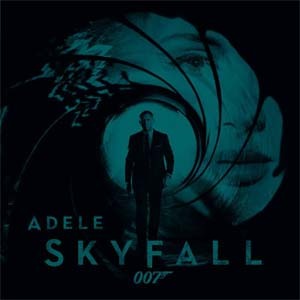 As expected, globally-adored superstar Adele snagged a 2013 Oscar nomination this morning for “Skyfall,” her theme from the latest James Bond movie of the same name. The track will compete for the Academy Award for Best Original Song with four lesser-known tunes. Will Adele win the Oscar? Read on for our prediction. Adele is nominated with her co-writer and producer, Paul Epworth, who also produced “Rolling in the Deep” and a few other tracks on her mega-selling 21 album. Just about everything Adele touches right now turns to gold. Well, aside from this song, which managed to reach #8 on the Billboard Hot 100 but didn’t perform particularly well at radio. Who is Adele’s competition? As usual, songs by acclaimed, big-name acts were largely bypassed. Family Guy creator – and upcoming Oscar host – Seth MacFarlane got nominated for “Everybody Needs a Best Friend,” from MacFarlane’s teddy bear film Ted. Pop songstress Norah Jones sang the tune, so voters could decide to reward that song with the Oscar. Other nominees include “Before My Time” from Chasing Ice, “Pi’s Lullaby” from Life of Pi, and “Suddenly” from Les Miserables. This is a really weak category considering the edgy artists who were eligible: Arcade Fire, Black Keys, Fiona Apple, Beck, Florence + the Machine, John Legend, Mumford & Sons, the Crystal Method, and more. We can only hope that one of these days, the Academy actually begins recognizing bands and songs that are actually current and innovative. Why is Nicki Minaj Nominated For Only One BET Hip Hop Award?